The sourdough starter is simply combined by flour and water and left to sit or ferment. Sourdough starter is the leavening agent in sourdough bread that denotes the characteristically unique, sour flavor. Sourdough starters originated in Egypt when Egyptians would reserve small pieces of dough to help with the next day’s bake. Bakers who had lighter bread became better known for their starters, and were encouraged to keep them active. The sourdough starter is simply combined by flour and water and left to sit or ferment. In the first week, it is necessary to “feed” the starter additional water and flour every twelve hours, and every twenty-four hours following the first week. When mixed together, flour and water activates the amylase enzymes, which breaks down starch into maltose. This maltose is then broken down further into glucose, which is yeast’s food. The feeding yeast produce carbon dioxide, which is what makes the starter rise. Lacto bacilli are also produced in this process, which create lactic acid that gives sourdough its distinct flavor. The starter generally comprises between 5 and 50% of the flour weight in bread. In San Francisco, the starter comprises 40% of flour in the dough. There are many kinds of starters, including those with additions of organic grapes, basil, and water from boiled potatoes. Grapes have natural yeast in their skin, allowing the starter to grow faster. Basil is common in Greece and also used for the additional yeast. Potato starch gives additional starch to increase rising in “levain” as well. 2. ½ cup warm water. It is important to have filtered water so that the chlorine found in much of the tap water will not kill yeast. • Mix together flour and warm water gently, in a container that is at least twice the size as the initial mixture. 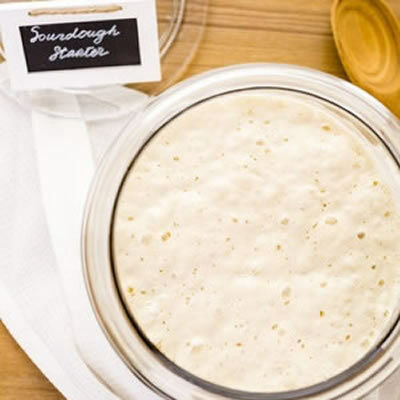 • Cover the mixture with a cloth, make sure it is not completely air tight, as natural yeast from the air will help the sourdough starter grow faster and add additional flavor. Let this sit in a warm place for twelve hours. • After twelve hours, add an additional ½ cup of flour and ½ cup of water, stir again, and let the mixture sit again for twelve hours. • Continue to refresh this mixture with additional flour and water in equal proportions for 2 to 3 days, to ensure that the starter is established. The starter is established once it doubles in size easily, containing large air bubbles. When this is achieved, it is ready for use. The starter can be used anywhere up to 50% of the total dough, for a stronger smelling sourdough bread. •The starter needs to be refreshed by removing ½ cup of the starter, before mixing in another ½ cup flour and ½ cup water. •After this, store the starter in a container and continue to refresh the starter once every twenty-four hours at room temperature. As long as it is being refreshed, the starter will stay active and continue to make sourdough. Starters can literally last decades, and older starters are often preferred for their consistency and stability. • If a brown liquid appears on the top of the starter, simply poor this layer off. It is called the “hooch” and signifies that the starter received too much water. Although this layer will protect the sourdough from growing mold on the surface during its conservation. • Do not let a starter sit at room temperature for more than three days, and do not let a starter sit in a refrigerated environment for more than one week without refreshing it. If this happens, the acidity of the starter will be compromised and the gluten structure will not be strong enough to produce light and airy bread.